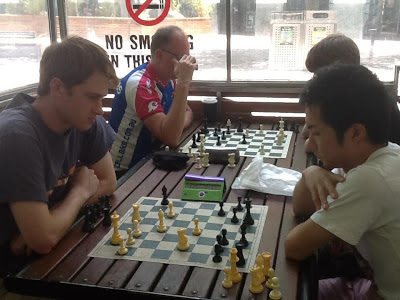 Yesterday Junta and I played in the ACT Rapid Championship, which was held in the traditional spot outside King O'Malley's in Civic (the centre of Canberra). It was a 7-round tournament that attracted quite a decent field of 36 players.We both got to 4/4 and played each other in Round 5. The game can be seen below. Just after Junta took on b3 my clock ran down to zero, so we shook hands and agreed a draw, as he only had a bishop left on the board, and I only had one pawn. In fact, Shaun Press remarked after this that he could have claimed a win because technically checkmate was still possible. The game in progress. Photo courtesy of Shaun Press. After this we both won our last two games, and so tied for equal first on 6.5/7, winning $125 each. Unfortunately the title can only go to one person, and in this case Junta won on countback, thus claiming the title of ACT Rapid Champion for the 4th (!) year in a row. This is made particularly impressive by the fact that in one or two of those years GM David Smerdon also played, along with players like FM Endre Ambrus, Yi Yuan, and myself. A write-up of this tournament by Shaun Press can be found here. Funnily enough we both tied for equal first in the ACT Championship this year as well (though the Lightning was won by someone else). Also funny is the fact that the game shown above could just be our first draw... ever... in tournament chess (and it was barely even a draw!). We have played each other 20+ times in long time control games and quite a few times in rapid and blitz, and as far as I know there hasn't been one indecisive result. Junta, Moulthun and I will soon be competing in the Austalian Open at Norths Chess Club in Sydney. The tournament is looking very strong with several titled players and norm possibilities, and we are all looking forward to it. The tournament website can be found here. Also, the World Cities Teams Championship has just started - and Australia has a team. Click here to go to the tournament website. And, last but not least, Merry Christmas!